When you try to install Internet explorer it could not installed and get this message ‘Internet Explorer did not finish Installing’ , that means here are some problem with the WINDOWS UPDATE. We have the proper solution for that error message ‘Internet Explorer Did Not Finish Installing’ please follow below steps. 4. Go to the Controlpanel>>program and features>>then select the left pane option>> Turn the windows feature on or off>>then you will get this below pop up and then>>uncheck the Internet Explorer>> and restart the computer, after restarting again open the same and now check that option and again do restart. Download and run the installation package of Internet explorer 9. 6. If the problem resolved then turn on the firewall and anti virus as well. 8. Please click on this link and run that fix for windows updates. 9. Click on Start button and ten type CMD and then click Run as administrator , when CMD will open then run these four lines one by one. Then restart the computer it has automatic install the updates, then after restarting try to install internet explorer again. Clicking on start and then click on accessories then RIGHT click on command prompt and then choose “Run as administrator” option. hi there, I’m having also problems with installing IE11. tried step 1-3, but step4 not working. when I click on nothing appears in the window. Tried to do it without it but again did not finish installing. I also get ‘Internet Explorer Did Not Finish Installing’ when I attempt to manually install IE10 (without going through Windows Update). So it’s not a problem with Windows Update. Any other ideas? 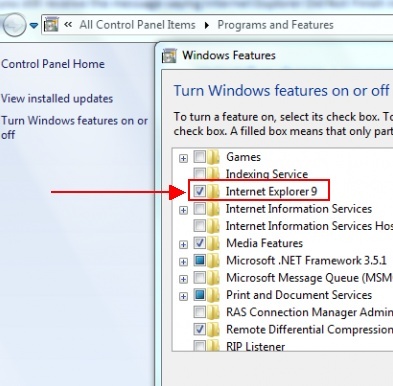 After I had tried to install IE 10 the first time it just stopped working while it was “configuring Windows – Do not turn of” so I had to do a hard reset of the PC. After this I was not able to install IE10, and kept receiving: ‘Internet Explorer Did Not Finish Installing’. After 3 hours of testing I found a solution (which I could not find anywhere online)! Booted in to Safe Mode and run the installer there. It installed with no errors. All antivirues have option to turn off firewall temporarily. Which antivirus do you have? Please check it again and let us know. hello, for me it is still not work.